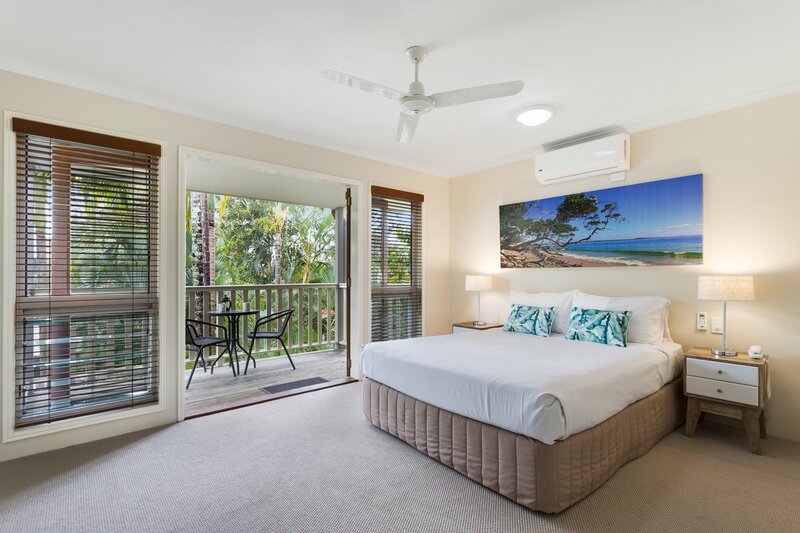 Sunset Cove Noosa resort is positioned in a peaceful yet central location of Noosaville, away from all the hustle and bustle of traffic noise and congestion. This pristine boutique property has an instant calming affect the moment you step foot onto the property. 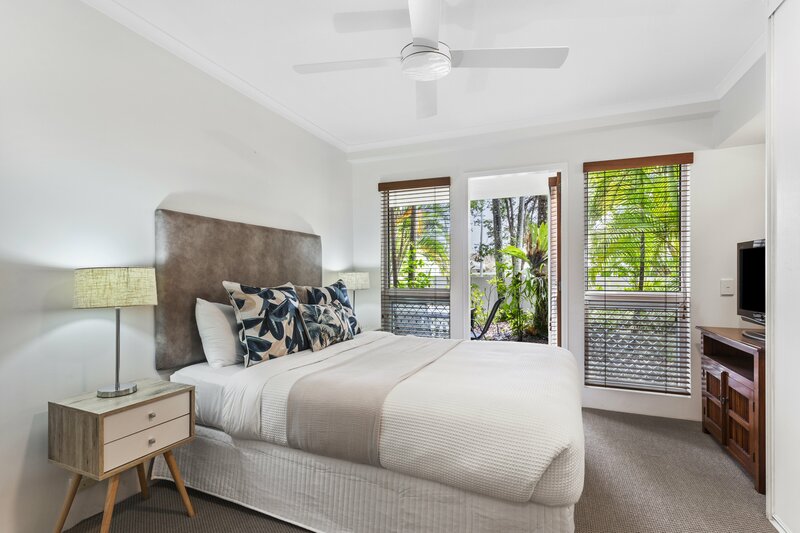 Set amongst luscious tropical gardens and palm trees - walking distance to everything you need to completely relax and unwind whilst on holidays with all the amenities required for an indulgent holiday Noosa Style. 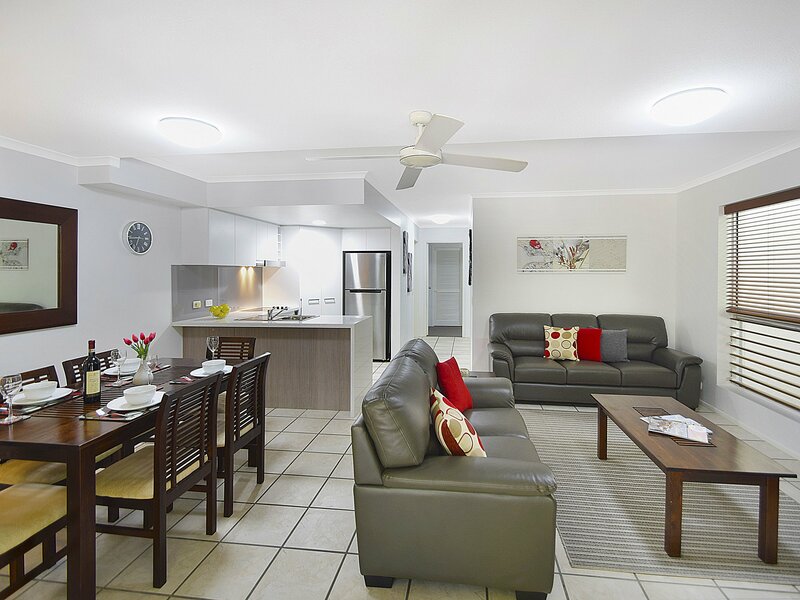 Sunset Cove Noosa comprises of 10 fully self contained, air-conditioned well appointed 1, 2 or 3 bedroom Superior & Deluxe Apartments or Townhouses. Our easy access ground floor apartments are in high demand - these units are bookable by special request (pending availability). 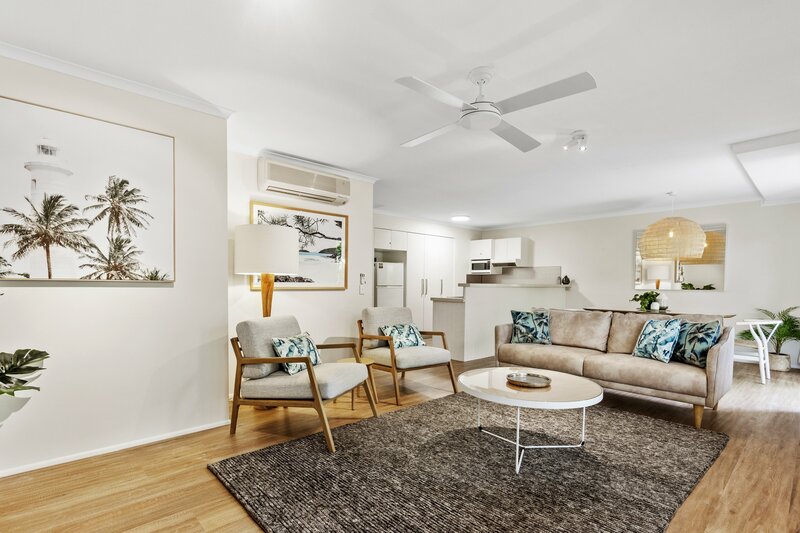 Queen bedroom, bathroom, air conditioning, well equipped kitchen, washing machine, dryer, free daily Wi-Fi, Foxtel channels & free undercover off-street parking for one vehicle. Recently refurbished well appointed deluxe apartment including en-suite and bathroom. Fully self contained, well equipped and air conditioned with free daily Wi-Fi, Foxtel channels and convenient off-street undercover parking for 1 vehicle. One Queen size bed. Recently renovated well appointed, spacious, self-contained apartment including en-suite and bathroom. Fully self contained and air conditioned with free daily wi-fi, Foxtel channels and convenient off-street undercover parking for 1 vehicle. Recently renovated well appointed, spacious, self-contained apartment including en-suite and bathroom. Fully self contained and air conditioned with free daily Wi-Fi, Foxtel channels and convenient off-street undercover parking for 1 vehicle.. Spacious two storey well appointed self contained Villa (master bedroom upstairs). Set amongst tropical gardens and swaying palm trees. Relax on secluded treetop balconies overlooking the lagoon style swimming pool & spa. 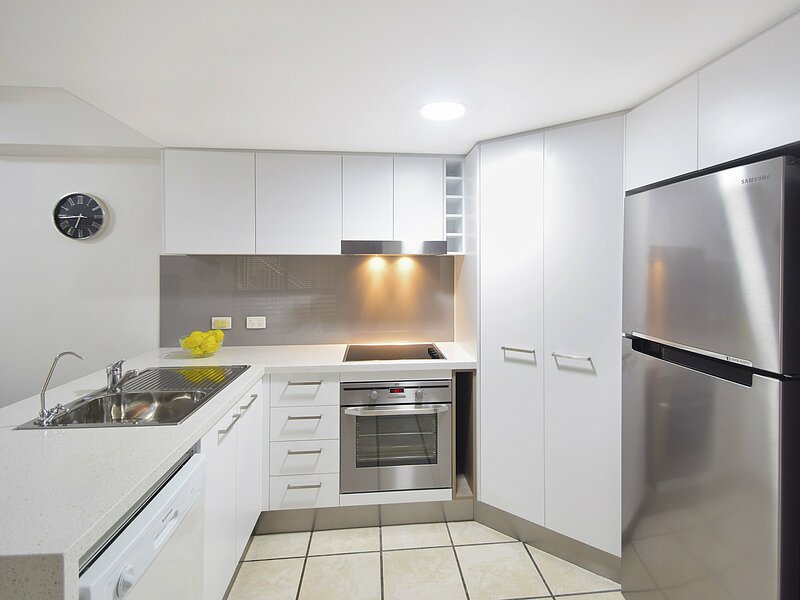 2 bedroom, 2 bathroom, self-contained, recently renovated apartment with air conditioning, free daily Wi-Fi, Foxtel channels & convenient undercover off street parking for 1 vehicle. Well appointed 2 bedroom, 2 bathroom fully self contained air conditioned apartment with pool view heated in Winter months. Free daily Wi-Fi, Foxtel channels & convenient undercover off-street parking for 1 vehicle. Ground floor with walk in shower in ensuite. Well appointed 2 bedroom, 2 bathroom fully self contained air conditioned apartment with pool view (swimming pool is heated in Winter months). Free daily Wi-Fi, Foxtel channels & convenient undercover off-street parking for 1 vehicle. Recently refurbished well appointed 2 bedroom deluxe apartment including en-suite and bathroom. Fully self contained, well equipped and air conditioned with free daily Wi-Fi, Foxtel channels and convenient off-street undercover parking for 1 vehicle. Bedding configuration 1 x Queen & 2 x Single Beds. Recently refurbished well appointed ground floor 2 bedroom luxury apartment including en-suite and second bathroom. Fully self contained, well equipped, air conditioned with free daily Wi-Fi, Foxtel channels and convenient off-street undercover parking for one vehicle. 1 x Queen + 2 x Single Beds. Spacious two storey well appointed self contained Villa (all bedrooms upstairs). Set amongst tropical gardens and swaying palm trees. 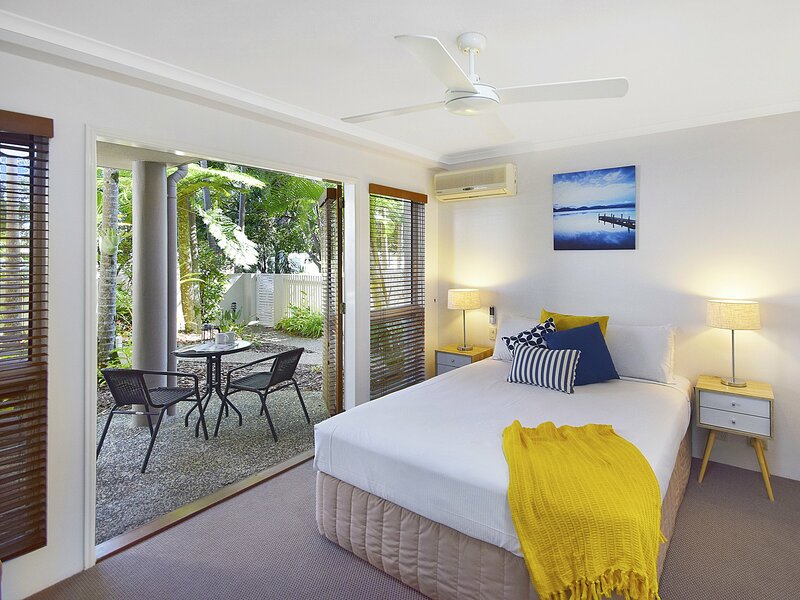 Relax on secluded treetop balconies overlooking the lagoon style swimming pool & spa. Recently renovated well appointed, spacious, self-contained apartment including 3 bedrooms, en-suite plus second bathroom. Fully self contained and air conditioned with free daily Wi-Fi, Foxtel channels and convenient off-street undercover parking for 1 vehicle. 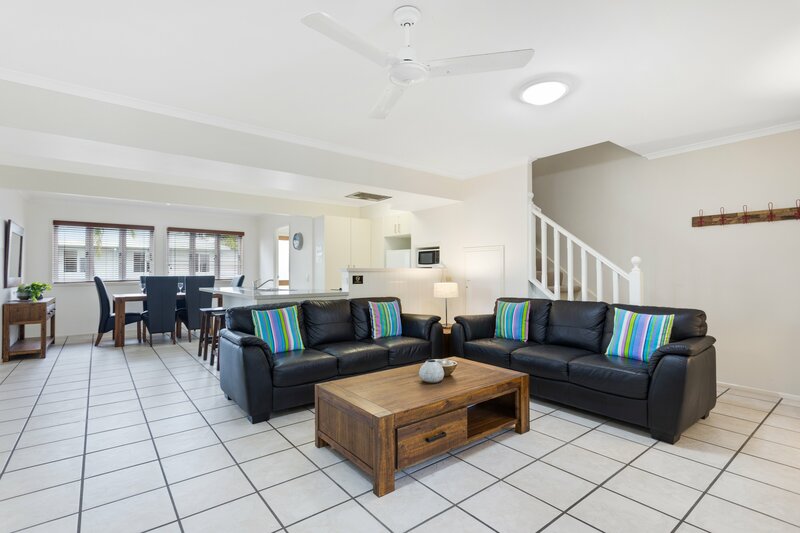 Spacious two storey well appointed 3 bed 3 bath self contained Villa (all bedrooms upstairs). Set amongst tropical gardens and swaying palm trees. 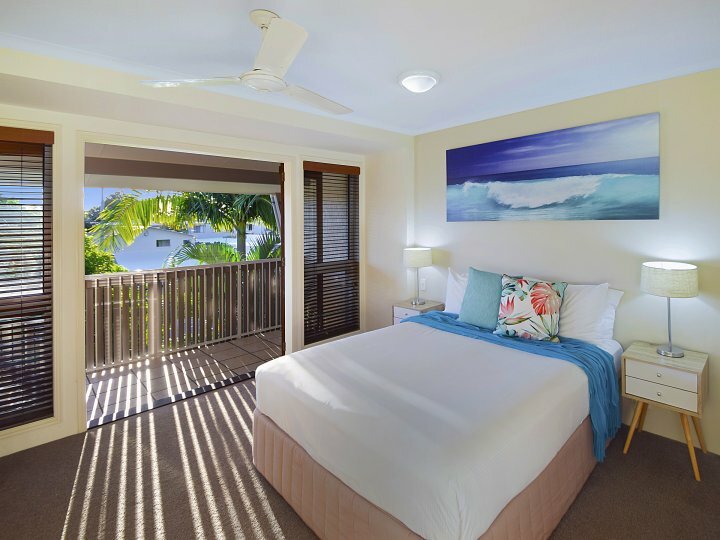 Relax on secluded treetop balconies overlooking the lagoon style swimming pool & spa. Pool is heated in Winter months. 50 inch flat screen Smart TV. Email, photocopying and printing services are available at Reception (for additional charge). Early check in or late checkout can be arranged. For all after hours guest arrivals a pin code will be required to access unit keys. Please contact the Manager 1 - 3 days prior to arrival date for important check in information which can be emailed or forwarded via sms to your mobile phone. The tariff permits a maximum of 2 guests in a 1 bedroom unit, 4 guests in a 2 bedroom unit and 6 guests in a 3 bedroom unit. One additional person is permitted in a Villa if arranged prior to check in for additional surcharge of $35.00 per night. 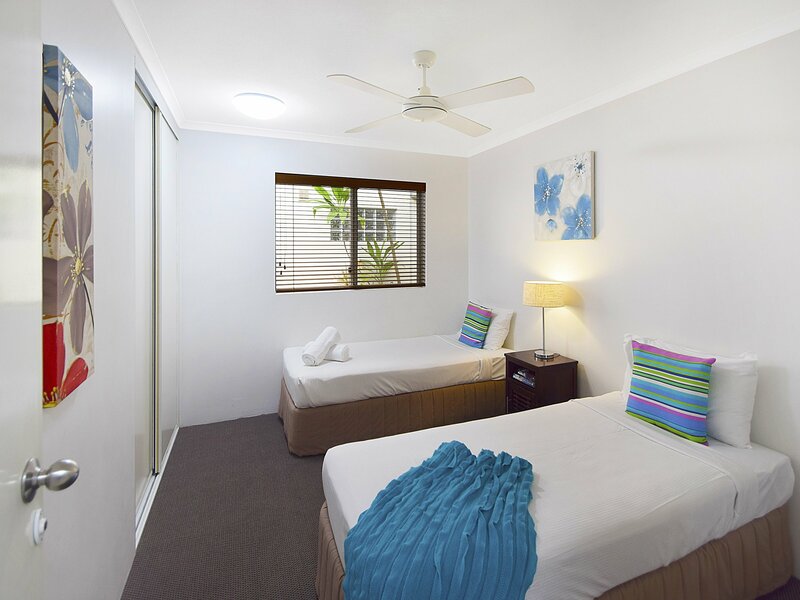 Infants under 12 months are free, hire cots are available and can be booked through Reception for $15-$20 per night. Free off-street undercover parking for one vehicle and ample on street parking for additional vehicles (no restriction). From Sunshine Coast Airport follow the signs to Noosa Heads using the Sunshine Motorway -State Route 70. 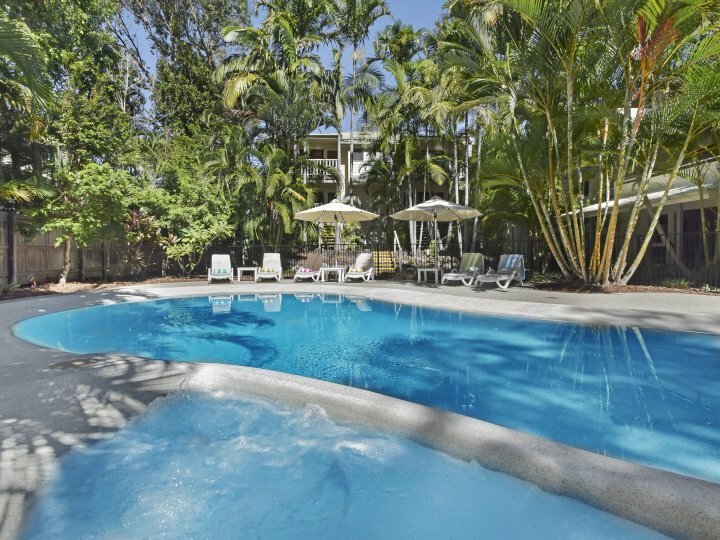 Relax in the tranquility of our much loved heated lagoon style swimming pool and spa surrounded by lush tropical gardens or unwind in the quiet sauna Enjoy a BBQ on the alfresco entertainment deck. 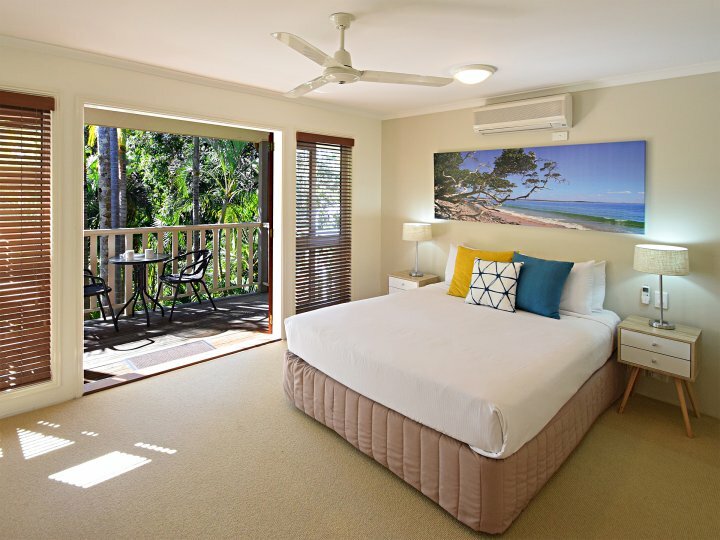 Explore the glorious Noosa River precinct located 100 metres from the resort where you can swim, hire a kayak, a stand up paddle board, or throw a fishing line in from one of the local jetties, experience Noosa's amazing sunsets from the perfect vantage point. Sample the mouth watering food from nearby award winning restaurants & bars, or grab delicious takeaway along Gympie Terrace walking distance to local shops, boutiques and cafes. Visit the Noosa National Park along the boardwalk to Hells Gates. 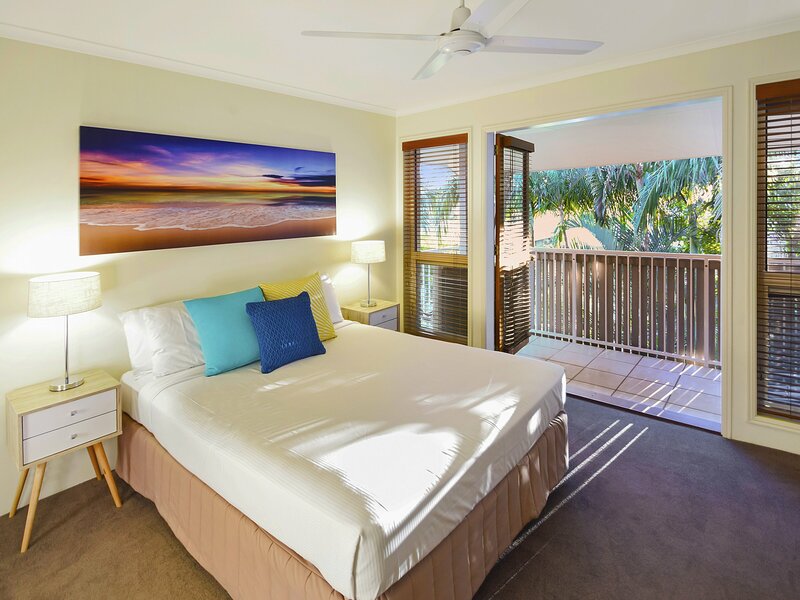 Swim in the world renown waters of the serene North facing Noosa Heads Main Beach or Tea Tree Bay. Drive 30 minutes inland to the Eumundi Markets and discover the breathtaking beauty of the Hinterland, provide alternative inland pleasures and are all easily accessible. Ask us to book you on an unforgettable day tour to beautiful Fraser Island or the Noosa Everglades with over 44 different bird species. All tours can be booked through the tour desk at Reception for no extra charge.